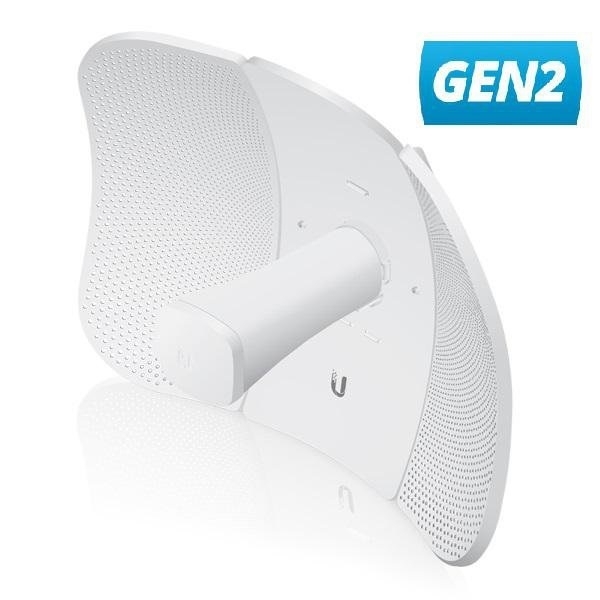 UBIQUITI LiteBeam 5AC 23dbi Gen2 LBE-5AC-GEN2, AirMax MIMO 2x2, outdoor 5 GHz, 802.11ac 1x GBit LAN, High Power, ultra-lightweight, POE 24V, Improved Noise Immunity. Ubiquiti Networks launches the latest generation of airMAX CPE (Customer Premises Equipment), the LiteBeam 5AC Gen 2, with dedicated Wi-Fi management. Ubiquiti’s InnerFeed technology integrates the radio into the feedhorn of an antenna, so there is no need for a cable. This improves performance because it eliminates cable losses. Featuring high performance and innovative mechanical design, the LiteBeam 5AC Gen 2 is versatile and cost effective to deploy.